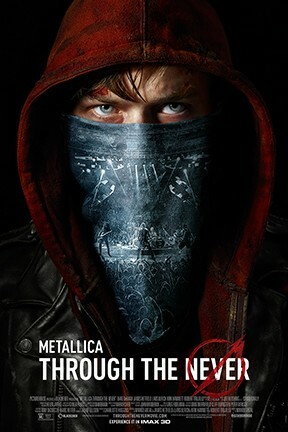 As the rock band Metallica performs a roaring set for fans in a sold-out arena, a young roadie named Trip (Dane DeHaan) is sent on a mission to meet a disabled truck and retrieve a particular item. However, the routine task turns into a surreal odyssey when Trip's van is hit by another vehicle and he finds himself up against a death-dealing horseman. As Trip flees through desolate streets, he has only his wits to help him avoid the deadly equestrian and deliver Metallica's cargo. Metallica: Through the Never 3D is not showing in any theaters in the area.